Full-grain leather upper. PK mesh lining. Removable full cushion molded EVA insole. Rubber and polyurethane slip resistant outsole. Goodyear welt construction. Wolverine Steel Toe Boots and Shoes are rated ASTM F2413-05 M I/75 C/75. Steel toe boots protect your feet from falling or rolling objects. Slips and falls are the leading cause of job-related injuries. Take control with slip resistant boots and shoes. Get through the workday in comfort and safety. 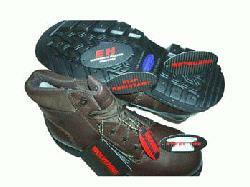 Wolverine Electrical Hazard (EH) Boots and Shoes are rated ASTM F2413-05 M I/75 C/75 EH. Special EH construction protects the wearers foot from electrical current on dry surfaces.